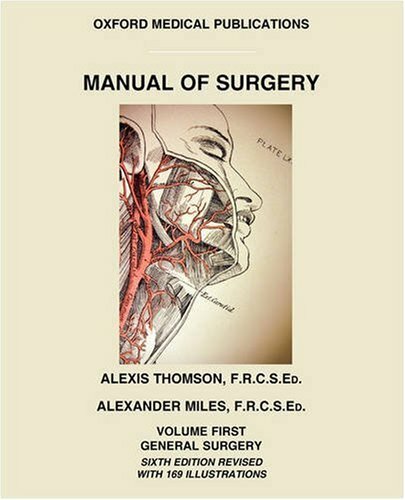 This is the 6th edition of the Manual of Surgery, published in 1921. Now outdated, this book is of great historical significance. It is also popular for its grotesque photos and descriptions of a wide range of medical conditions. Contents: Repair; Conditions Which Interfere With Repair; Inflammation; Suppuration; Ulceration And Ulcers; Gangrene; Bacterial And Other Wound Infections; Tuberculosis; Syphilis; Tumours; Injuries; Methods Of Wound Treatment; Constitutional Effects Of Injuries; The Blood Vessels; The Lymph Vessels And Glands; The Nerves; The Skin And Subcutaneous Tissue; The Muscles, Tendons, And Tendon Sheaths; The BursÆ; Diseases Of Bone; Diseases Of Joints.